Over the past few years, I’ve tried to embrace the world of My Little Pony Friendship is Magic to see if it’s something my 3-year-old daughter responds to. At first, she didn’t seem all that interested, but since that first introduction she has become a huge fan of the spinoff series Equestria Girls and also watches the regular series when it pops up on TV. Since we moved last fall, we’ve got much better cable which increases her choices and also allows for us to tap into On Demand. Not long ago we caught an episode called “Call of the Cutie” which focused on three younger ponies named Sweetie Bell, Scootaloo and Apple Bloom who don’t yet have their cutie marks, the symbol that appears on the horse’s flank that indicates their special skill. 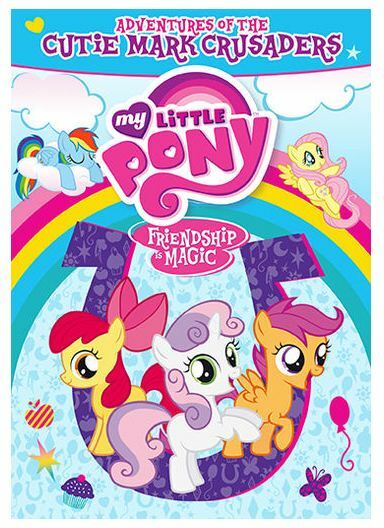 So, when I got an e-mail asking if I’d be interested in reviewing My Little Pony Friendship Is Magic: Adventures Of The Cutie Mark Crusaders I was very much on board. Since then, my daughter has watched this five episode disc all the way through several times. The other day I asked her what she likes about it and she essentially said that she appreciates seeing young ponies going on adventures. I thought that was really interesting, but it makes sense considering how young or youthful all her favorite main characters from animation are. It just makes sense that she’s appreciate younger characters with manes! “The Cutie Mark Chronicles,” “The Cutie Pox,” “Flight To The Finish,” “Pinkie Pride” and “Twilight Time” are all quality episodes that aren’t too on-the-nose about their themes which deal with lots of growing-up issues. The whole idea of not having cutie marks yet is a great metaphor for development that I think can be useful in the future. I’ve come to realize that, while some elements of these shows might go over the kids’ heads at this young age, they can be used as points of reference later on when you’re trying to explain aspects of life to your kids. I recommend sitting down and watching these episodes with your children and taking mental notes for what might be useful later on. My only complaint about this DVD is that it doesn’t include “Call Of The Cutie” which sets the whole thing up. That’s just me though. I like context, but I’m pretty sure my kiddo doesn’t care.